NCERT Exemplar Solutions for CBSE Class 12 Physics are available here. With this article, you will get solutions from question number 5.21 to question number 5.25. Solutions of multiple choice questions with single correct answer (MCQ I), multiple choice questions with multiple correct answer (MCQ II), very short answer type questions (VSA) and short answer types questions (SA) are already available. These questions are very important for CBSE Class 12 Physics board exam & other competitive exams. 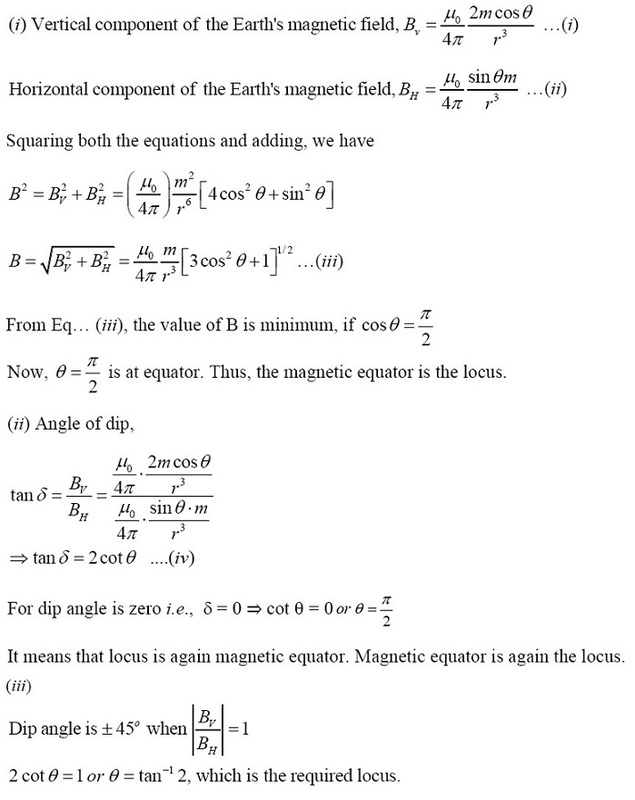 Question 5.21: Verify the Ampere’s law for magnetic field of a point dipole of dipole moment m = mkˆ. Take C as the closed curve running clockwise along (i) the z-axis from z = a > 0 to z = R; (ii) along the quarter circle of radius R and centre at the origin, in the first quadrant of x-z plane; (iii) along the x-axis from x = R to x = a, and (iv) along the quarter circle of radius a and centre at the origin in the first quadrant of x-z plane. Question 5.22: What are the dimensions of c, the magnetic susceptibility? Consider an H-atom. Gives an expression for c, upto a constant by constructing a quantity of dimensions of c, out of parameters of the atom e, m, v, R and m. Here, m is the electronic mass, v is electronic velocity, R is Bohr radius. Estimate the number so obtained and compare with the value of |c| ~ 10-5 for many solid materials. Question 5.24: Consider the plane S formed by the dipole axis and the axis of earth. Let P be point on the magnetic equator and in S. Let Q be the point of intersection of the geographical and magnetic equators. 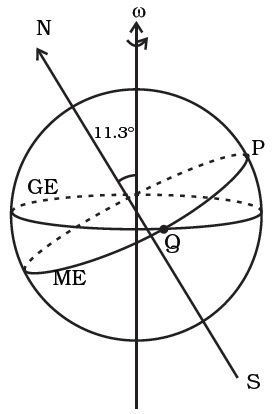 Obtain the declination and dip angles at P and Q.
P is also on magnetic equator. 2. Q is on magnetic equator. &there4; dip = 0 but declination = 11.3°. Question 5.25: There are two current carrying planar coils made each from identical wires of length L. C1 is circular (radius R) and C2 is square (side a). They are so constructed that they have same frequency of oscillation when they are placed in the same uniform B and carry the same current. Find a in terms of R.